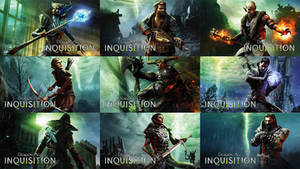 This was my entry to the Bioware Dragon Age Inquisition Poster Contest. They offered a tool kit full of various pngs and asked the fans to create a grand poster with a movie-like vibe out of them, and I have to say it was a fun challenge and helped me to get to know some Photoshop features better. It's safe to say I cannot wait to play the game once it comes out, so expect a lot of fan art after it did! I'm also working on my Calendar for 2015 right now, so you can expect an upload to my deviantArt shop soon. I hope autumn has treated you all well, and please let me know how you're doing! Have you played yet? I picked it up right away, had a lot of fun playing my female elf wizard Inquisitor. The Bull, Sera, Vivienne trio was hilarious! This is just wonderful! Be proud! I hope you won Can't wait to play the game. Wonderful, dear! This so beautiful and epic!! I LIKE NO I LOVE THAT PIECE OF ART !!! (sorry i am a little enthusiastic xD). Yay! And yes, this is very cool. I agree with KeinZantezuken, it is way too similar to the original cover. And not just because you used the assets, but it also has the same vibe. That being said, I like how you inverted it. The hero reaching for the light and the daemons dragging him down. Not bad, but too alike to the original poster, though.